Unfortunately the Chimpanzee brain has also been evolving the whole time... so it doesn't give us a window on the past at all. It shows us what 7 million years of parallel evidence produces. "Identifying what drove this evolutionary shift is fundamental to understanding what makes us human, but has been particularly challenging for scientists because of ethical prohibitions..."
-against admitting the reality of tribalism and all its ramifications. Tech drove overpopulation which resulted in tribes... protohumans who banded together in ever-larger groups to secure and defend resources. "The basic cause of war is rivalry. And Ferguson sees positive value in it, where Hobbes had seen only a necessary evil. Ferguson points out that warfare enforces civic unity, engenders civic virtue, promotes social organization, and in fact may be an essential condition for the very existence of civilization (Dawson, 1996). In addition to maintaining the balance-of-power between societies, Ferguson ascribes to warfare the function of maintaining solidarity and morale within societies. In-group amity depends upon out-group enmity and vice versa." Group selection began choosing ever larger and more cohesive tribes. The increasing complexities of tribal living created pressures to behave in very unnatural ways, such as sacrificing personal well-being, repro rights, and even life itself for the greater good. Our brains grew in response. Individuals with greater capacity to communicate more complex information, to grasp more abstract ideas, and to both remember the past and imagine possible futures - these are the ones who would survive the rigors of tribal living and reproduce. Conquering tribes would kill or enslave all the males of the vanquished and incorporate the females, thereby accelerating the evolution of bigger brains. This was the path that created the first domesticated ape. Tribalism is ingrained in our genetic structure. It dictates our social structure and social interaction. It easily explains our history in very uncomfortable ways and threatens to unravel the artifice of our conditioning. It shows us where we would be without technology, chronic overpopulation, and tribalism. Unfortunately the Chimpanzee brain has also been evolving the whole time..
Stuff doesn't evolve 'just because time passes' . Stuff evolves under environmental pressures. There's loads of stuff around (some fungi, viruses, plankton, .. ) that hasn't changed much in the past billion years or so - just because it works so well that there hasn't been enough environmental pressure for it to need to adapt. Interesting pieces to the particular puzzle. What on Earth are you talking about? Not biology in any case. It is trivial that the similarities help us reconstruct the common ancestor, and the individual lineage differences the individual evolution. Of course it becomes more uncertain since no reconstruction can be exact, but it is a far cry from saying that it gives no information at all. This is Biology 101. Group selection began choosing ever larger and more cohesive tribes. It seems to me you mean a racial construct; that is unlikely to have been an important factor in the human lineage and no factor in the chimp lineage. 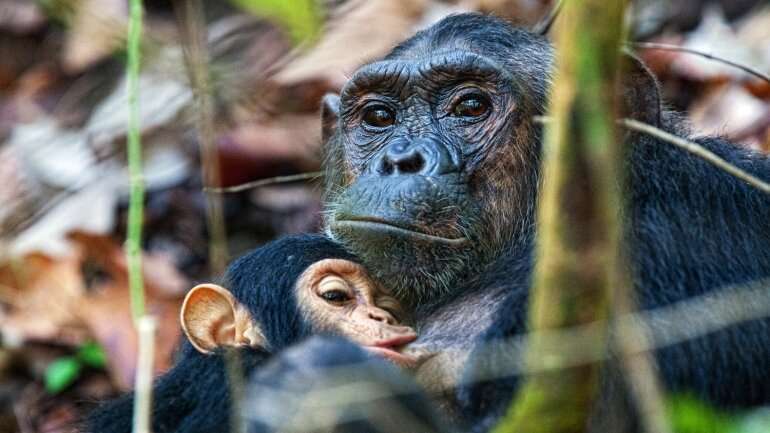 - ctd- Reversely, if you mean aggression between groups which can be severe in some chimp groups but not all, and rare in humans, that too is unlikely to have affected chimps much. "Group selection" has never been observed and deemed unlikely to be so by most biologists for that and for theoretical reasons (more unlikely and less pervasive than "selfish" gene selection), it is a fringe concept. "At some point during human evolution, a handful of genetic changes triggered a dramatic threefold expansion of the brain's neocortex"
"Tribalism implies the possession of a strong cultural or ethnic identity that separates one member of a group from the members of another group. Based on strong relations of proximity and kinship, members of a tribe tend to possess a strong feeling of identity. Objectively, for a customary tribal society to form there needs to be ongoing customary organization, enquiry and exchange. However, intense feelings of common identity can lead people to feel tribally connected." -Ive posted quotes from this essay many times. If you think you have valid objections to what I'm saying you ought to at least read it in its entirety. Group selection is such a taboo topic that lots of mainstream academies refuse to touch it. Tribalism is unique to the human species although it has many natural analogues. Goodall observed intergroup warfare among apes. Worker bees have surrendered their repro rights for the good of the tribe. But it is only with human influence that we can use the term domestication. We have domesticated plants and animals to serve us. The tribe has domesticated the human ape to serve IT. "Self-domestication theories describe how humans developed and evolved." "Gregory Stock, director of the UCLA School of Medicine's Program of Medicine, Technology and Society, describes self-domestication as a process which "... mirrors our domestication [of animals] ... we have transformed ourselves through a similar process of self-selection ... our transformation has been primarily cultural [read tribe], but it has almost certainly had a biological component." "The most comprehensive case for human self-domestication has been proposed for the changes that account for the much later transition from robust humans such as Neanderthals or Denisovans to anatomically modern humans." "a statistically significant number of genes associated with domestication which overlapped between domestic animals and modern humans, but not with their wild equals, like Neanderthals"
-I can keep throwing quotes at you but unless you read their sources (a few wiki pages and the rechten essay) then you have no argument. "Dawkins suggests that group selection fails to make an appropriate distinction between replicators and vehicles. "The psychologist Steven Pinker concluded that "group selection has no useful role to play in psychology or social science"
-Again, the idea that humans emerged as a result of millenia of larger and more cohesive tribes systematically wiping out the competition and impregnating all the females, is a little hard for these guys to swallow. And also outside their disciplines. Selfish genes know when the best way to propagate is to band together with other 'vehicles' to ensure their survival. IOW the ones that failed to do this were the ones that died out. Slaughtered and consumed. Ground into dust. Yes, Humans are relatively peaceful, and you provide no reference to "tribalism" effects under millions of years of evolution. Are *you* serious? We discussed group and other selection in basic biology courses at university; it is not taboo but as I said found to be not happening; your own quotes allude to that fact. And again you give no references supporting group selection. Maybe I should read you as confused by what it means, since you start to discuss self-domestication and gene-level selection. This is like saying that lions or raccoons or dogs are relatively peaceful. Any animal can be expected to fight like hell when cornered or its family is threatened. Due to the FACT that humans have been using tech for a million years to systematically eliminate the natural attritive elements from their environment, the FACT is that overpopulation has always been a problem. It forced humanity to band into tribes for survival. And tribes have been fighting ever since. It's what caused the rapid and thorough spread of our species around the globe and into every possible niche no matter how inhospitable. -And I bet you discussed such crap as tabula rasa as well. Academies - their job is to mold and shape human opinion and behavior, not explain it. Domestication is ongoing. The greatest legend ever told, was about group selection. God gave the 12 tribes the right to invade the holy land and cleanse it of canaanites, philistines, and the lot. More recently the bantu tribes set out to claim their holy land from the khoisan, who would have been exterminated without western intervention. Any natural evolutionary advantages they had accrued would have been lost. Iroquois, with western help, chased the huron north to an island in the great lakes and exterminated them. And then the west exterminated the iroquois. Western influence was for them both a very unnatural evolutionary advantage and a detriment. Where did the Basque come from? All related tribes exterminated. Tribe after tribe overrun, obliterated, enslaved, their women absorbed, their genes added to the amalgam. Our history is nothing BUT a record of intertribal conflict, which is the human form of group selection. The recent Rwanda/Burundi genocides. Tutsi and hutu tribes, among the highest fertility rates in the world. Evidence says they were originally a single people, driven apart by the age-old herder/grower conflict as immortalized in the cain/abel fratricide, the first murder... and by nefarious euro machinations. Classic intertribal warfare, driven by explosive population growth and subsequent shortages of land and resources. Countless examples throughout all of history, including the history we have gleaned form innumerable hunter gatherer tribes around the globe. What makes you think that this wasnt common throughout the pleistocene? "So why were the people of Nataruk attacked? We have to conclude that they had valuable resources that were worth fighting for – water, meat, fish, nuts, or indeed women and children. This suggests that two of the conditions associated with warfare among settled societies – territory and resources – were probably common among these hunter-gatherers, and that we have underestimated their role so far." -Academies wanted us to believe that maya and Aztec were peaceful, innocent people until undeniable evidence of their bloodthirsty savagery was unearthed. "Maori Warriors were some of the fiercest warriors the world has ever known. Their bravery and savageness are legendary. Throughout their history war was a part of Maori life. Conflicts over land and insults of any type were the main catalyst for war." -new guinea cannibals, Sentinelese murdering outsiders, inuit slaughtering vikings. The norm.